It’s not a MAGA hat. I’m writing from the eye of a hurricane. Violent summer’s end, exclamation point. This essay is not advice, the cheerful looking-forward essay that appears in spring. I’m feeling retrospective. Kicking through the ashes of holiday recently gone by, receding memory. Ocracoke island. Like all true sociopaths, our ideal vacation setting was as inaccessible as we could manage with two children in tow. A beach vacation of diminished crowds and radically winnowed access to goods-and-services. Two hours via ferry from the sad tumbledown towns of remote coastal Carolina, three hours in a car through swamp and empty geometric agricultural isolation, without wifi. Past all the Dollar Generals, with a requisite stop at Bojangles: even for Biscuitville, this place is a bridge too far. I last visited Ocracoke as a teenager, a UNC freshman with a car and a poor understanding of the physics of driving on sand. We ran aground somewhere near Duck, met a helpful carpet-layer with an Econoline van and the time and inclination to tow us from the dunes. Car camping, isolation: the southern outer banks were even more deserted back then. Improbably, my tiny Mazda contained a love triangle, tension for close-quarters travel. My affable, fragile roommate was in love with my “girlfriend” for whom I felt some ambivalence that over time would grow into resentment. She was strongly attached to me. Her willpower was the dominant force in our lives: my wavering and his insecure love blew over like sea grass in its path. A day late, running on fumes and maxed-out credit cards, we arrived in Ocracoke. It was wonderfully, eerily empty. Quiet, nothing. A meandering collection of old southern houses, gravel roads, a few boats. It was spring. There may have been tourists, I didn’t see them. Not sure exactly where we stayed. The place had an old manual card-swiper, the knuckle-busting kind we still used in power outages at my wine shop decades later. My return to Ocracoke 19 years later was essentially unmarked by memory. The place was new again. My thoughts of it were less sepia-toned than covered in a layer of dust, faded film left in the light, a window left open for too long. The stages of life had changed. This trip was very intentional, mapped down to the last detail months in advance, ferry schedules pored over and debated, accommodations analysed in detail impossible back in the 20th century, before the internet’s true dawn. I argued successfully to take the Swan Quarter passage, a longer ferry ride across Pamilco Sound that shortened the interminable “are we there yet?” car travel with kids by an hour. As a parent I’m a little tickled by how true-to-stereotype my daughters are inside our station wagon. We’re lucky to be 30 minutes from home when the five-year-old lets fly the first salvo. By Tarboro the unremitting waves of “are we there yet?” have battered us to submission. Crumbling sanity forces a fast food stop. Sweet silence reigns while girls are stuffing their faces with chicken biscuits. And soon we are in the true unknown, marveling at the empty grid lines on the car’s GPS that show us rising vertically into space, taking off into Tron. We count, compare, and award medals for the best abandoned buildings we pass. They are impressive in quantity and level of architectural submission to creeping nature, kudzoo and ceiling beam interwoven, farmhouse and century-old barn peeling away from functionality and joining the organic world. Splintered grey siding yielding to mold, rusted barn tin bent by the wind, reaching into the otherwise unbroken sky above. I see a cluster of men digging a grave, waist deep with shovels, a scene from a different century. We drive along levees between patties of soybean and corn, a horizon that seems tailor-made for flood irrigation and rice. Small commercial fishing boats in various levels of maintenance dot the sound-side water. We arrive in Swan Quarter, a moviescape of emptiness dwarfed by a clean modern administrative complex and courthouse. Megan has been here before, for a traffic violation (not hers.) The only other movement is at the ferry terminal, and all signs funnel us to its lanes. They skirt close to stating, “there is nothing else here for you. Only this. Don’t delay, or look too closely.” A pet chicken roams around the terminus. People are relaxed, helpful. My girls make a fast friend who days later we’ll see on the beach. On the other side of the sound, where we belong. My long absence is not the reason I misread the supply situation. In 1994 I had no need for fancy food and wine, for kid-appropriate fare, for comforts. We had a tent and sleeping bags. Maybe snacks, possibly beer, maybe not. In haste to arrive an hour early for our ferry, we forgot to pick herbs from our garden. But the wholesale absence of produce on the island didn’t sink in until we landed. Ocracoke has the best seafood in North Carolina, thanks to the working fishermen’s co-op in the center of town. And we needed it! Just-caught giant shrimp, yellowfin tuna, swordfish, scallops, sea trout, perfect seafood displaced all other sources of calories in our week offshore. Except ice cream. And pasta. And wine! There are two places to buy wine in Ocracoke. I thought I’d brought a week’s-worth with us. I radically underestimated the effects of exile and separation from quotidian labor on my rate of wine consumption. We’d drained our cellar by Tuesday, and had to pick up bottles from the island’s shops. Here’s my wine diary from the trip. I hope it can be both a guide and a cautionary tale. We had top-notch family time, great meals, I came home happy and a little tan. But a wine professional ought to do better when planning for all-important vacation meals. It’s my job to make good wine for meals (special and everyday) appear. Perhaps I stumbled. Day 1: Drink all the good stuff. I have no patience. Or, what patience I had died roadside hours ago. I rush out, buy two pounds of huge shrimp, and made a lemony, delicious chitarra pasta. The utter lack of vegetables hasn’t dawned on me yet. We eat on the porch, and drink glasses of Thierry Germain Insolite. The wine is so good I am momentarily distracted from the fact that our rental house is surrounded with small cemeteries full of Spanish moss and 19th century graves. Megan accurately describes our bedroom for the week as decorated in the style of the Black Lodge in Twin Peaks. Not the ideal refuge from ghosts. At least it’s on the second floor. Ghosts can’t climb stairs. Everyone knows that. Day 2: The day we all burn. Whew, that was creepy. From now on, I’ll stay inside after dark. A few hours at the beach will burn off the ghostly haze. And the top layer of my skin. 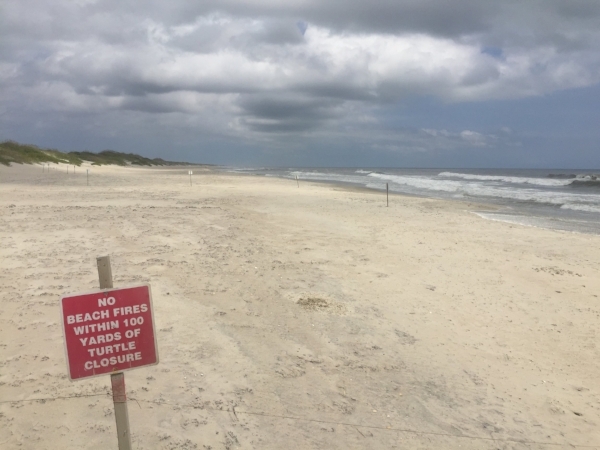 Away from the lifeguard beach you can walk for miles, alone with your thoughts, the only sign of civilization being literal signs instructing one not to stomp on the buried sea turtle eggs, or set the beach on fire. It is peaceful. The white noise of waves is at perfect decibel level to drown out the omnipresent chatter of a 10-year-old. So many questions! What am I, a marine biologist? Ask a research device how all this stuff got here. I’m thinking about dinner. Several hours being battered by waves and sun will stir up an appetite! A three-story fig tree in the backyard is full of fruit on the leading edge of ripeness. I implore my fig-mad kids to leave them for just a day longer. To no avail. It’s true: the birds won’t wait. We feast, then feast again on yellowfin tuna sashimi and scallops. From the moment I lay eyes on it in the seafood co-op, every primal fiber of my being wants to gorge on the tuna. It is otherworldly, vivid, glistening. I struggle not to push the woman in line in front of me to the ground to procure this maddeningly perfect meat. I rush home, do some quick You Tube research, and begin slicing. We serve a bottle of Roulot Bourgogne Blanc with dinner, knowing full well that our meal has crossed a threshold. It is obscenely delicious. One day we may have to stand trial for our crimes. Day 3: We venture out in search of the worst meal of the year. Hello, Cap’n! Ahoy! Do you have a fryer, and a bottomless pit of frozen margarita mix? We’ll, we’re at the beach, this must be our spot to day drink and watch the seagulls rip fish heads to shreds just yards from where we dine. Ooh, tarter sauce with our hush puppies and fries: a local delicacy! It rains. We abandon the beach in search of kid-friendly lunch fare. Cooking every meal in our ghost house is already getting onerous. We sit outside on a covered patio and suffer a little spray from the wind and rain. But it’s fine! We’re having fun. The kids love the pelicans, and I’m content with the gut-bomb fare. The bluefish seems fresh. Nothing wrong with a sprinkling of mediocrity in our holidays. Thank you, tequila! I go for a run along highway 12. It is straight, flat, dunes on both sides, marked only by telephone poles. The occasional couple on rented bikes glide by. I sweat, give thanks to Neptune for the cloud cover and constant wind. Tedium. It’s nature’s treadmill out here. Next up: shrimp and grits! Megan brought some beautiful foraged mushrooms from the Duke farmer’s market. Our summer tomato supply is dwindling. The last wine from home is gone. We buy the most promising locally-available options. Prices are high, but considering where we are, you can’t complain. Note Blanche from Domaine Franck Pesson is the realest-looking French wine on the island. It eases our transition into the next stage of our holiday, watching the random VHS tapes scattered around the rental. E.T. is up first. I’ve never seen it. It is heartwarming. The wine, like the film, has no rough edges. A pleaser. Day 5: Ambling about. Sea trout. We go for a walk. After four days in the waves, the girls are sick of the sight of the beach. Luckily, Ocracoke is pretty walkable, if you don’t mind dodging those infernal golf carts people roll around in. It’s flat. Able-bodied adults who refuse to stroll around a tiny flat island community but instead have to introduce beat-up country club transport to the small roads and paths we traverse… I look askance at these people. I glare, sometimes at their walrus abdomens. We walk. The girls grump. But they like the lighthouse, and the maritime forest, where we see a snake. They play games. Fiona brings along Baby Jaguar, and takes holiday photos with her beloved pet. At night we eat sea trout and orzo and tomatoes. The pasta selection on Ocracoke is small. The girls love orzo. To me it’s disappointing rice. We watch Young Frankenstein. Less successful than E.T. Too much kissing for the girls. I’ve never been into Mel Brooks. It’s quotable for sure. It’s like the bible: kids should be exposed to it, but I don’t believe. Astrid is more Monty Python than Mel Brooks. A truly wretched Verdicchio mars this evening for me. Day 6: I get a blister. Shirtless and shoeless on the beach for five miles. The sea is angry, I pass a few dogs and soul surfers, but otherwise I revel in cool spray, the search for firm-enough sand, the realization that I’m in a national park, alone. At the end of the day we get ice cream. I get a strawberry parfait. I deserve it. Sandcastles are constructed. We all are sensing the finish line. I make mahi with chitarra pasta and every last sad scrap of produce I can muster from the community store. We drink Heitz Grignolino rose. It’s fruity, bright, a really nice return to form after the previous evening’s worst-case Verdicchio. Our last real wine, and the only red of the trip, is Clos Roche Blanche cuvee pif. The correct number of reds to bring to the beach may be zero. I always sneak down one or two, and they sit forlorn until all options are exhausted. This throwback from the final vintage at CRB is all the good things when served at 55 degrees. We watched Splash. The girls found it to be a frustrating film. Lots of questions. I’m wondering if we should get a VCR again. Maybe they are best left for vacations.